The 2018 Chevrolet Impala is a full-size sedan that anyone would be lucky to own, from the proud parent to the single working person. The 2018 Impala Chevrolet combines a reasonable price with outstanding features in regards to safety as well as to innovation, and makes driving, even for your morning commute, far less of a chore. Drivers and critics rave about the interior and exterior design of the car, which is sleek yet understated, roomy enough for comfort but not big enough to become a nuisance (such as in parking situations). The 2018 Chevrolet Impala allows you to enjoy driving the way that it is meant to be and allows a great deal of personal customization. Offering three trim levels and up to 10 exterior colors, not to mention many available premium features and packages. But even without the addition of premium features (for those who might be looking to stick to a budget that’s more on the strict side), the 2018 Chevrolet Impala offers some truly outstanding amenities and features. From an 8-inch touchscreen display to the latest in preventative safety technology, the 2018 Chevrolet Impala is sure to please any driver! Comfort and convenience while on the road are essential, particularly if you spend long periods of time in your car, either because of a business trip, family vacation and road trip, or even just due to a long daily commute. If your car is not comfortable, you’re less likely to enjoy your time on the road. Fortunately, comfort and convenience are both made a priority in the 2018 Chevrolet Impala. This can be seen in the quality of the interior of the vehicle, which includes an eight-inch touchscreen to help you navigate as well as connect to your contacts and perform a number of other important services that will better your driving experience. This touchscreen also connects you to the radio, making it easier to flip through stations than ever before. Best of all, this is a feature that comes as a standard part of the vehicle at no extra cost. And speaking of the radio, this car has a sound system that will make listening to your favorite music a whole body experience. With six speakers strategically placed throughout the interior of the vehicle, there’s no doubt about it that you’ll enjoy your music like you never have before. And with the standard subscription to Sirius XM radio that also comes as part of the typical package for the 2018 Chevrolet Impala, you can listen to pretty much anything you like. Comfort and convenience are further enhanced by the technological features of this full-size sedan with its onboard 4G LTE WIFI that allows drivers and passengers to remain connected to their devices at all times. Drivers can enjoy the added convenience of the myChevrolet Mobile App which allows users to start and stop their vehicle, view important diagnostics, set reminders for parking, and upload locations to their navigation system. 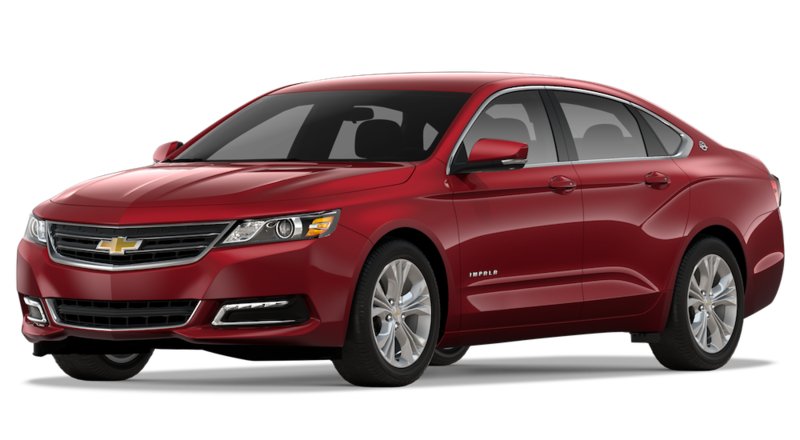 Along with being reasonably priced, with an MSRP of just over $27,000, the 2018 Chevrolet Impala proves to be an excellent long-term value with exceptional fuel-efficiency. Adding to its near universal affordability, value will be felt for years to come when visiting the fuel pump. The 2018 Chevrolet Impala is an excellent example of a fuel efficient vehicle, and an excellent option for the most environmentally friendly driver. For city driving, driving in congested often metropolitan areas, the gas mileage is at an impressive 22 miles per gallon. For highway driving, including the more rural areas, the owner of the 2018 Chevrolet Impala can expect to get as many as 30 mpg. This type of gas mileage will keep a car going for a long time – and will reduce the amount of money that is ultimately spent on fuel, making it a more cost-efficient vehicle overall. In the long run, this makes the starting price – and the price of any premium features that you may decide to add on – more value-added than ever before. The safety of the 2018 Chevrolet Impala is one of its most important features. After all, safety is key, no matter who you are and what you might be looking for out of a car. The 2018 Chevrolet Impala also focuses on preventative safety features as well, helping you to avoid the unfortunate event of getting into a car crash entirely. Features such as forward collision alert and side blind zone alert coupled with lane departure warning system and rear cross traffic alert, can allow you and your car to work as one unit, with the set goal of preventing a car accident from ever occurring. These features can be particularly useful if you are a driver that perhaps lacks in confidence on the road, and can be ideal for new drivers as well. On top of this, ten airbags are included as part of the standard package, strategically placed all throughout the interior of the car for the maximum safety possible should a car accident ever occur. There are many reasons to choose the Depaula Chevrolet dealership for the purchase of your 2018 Chevrolet Impala. For one, you will be met with incredible service by a highly trained customer service and sales staff. This will give you ample opportunity to ask whatever questions that you might have, from the price of the car to the power of the engine to the different premium features that are currently being offered. Having someone skilled and ready to answer any question that you might have is a powerful tool and one that the DePaula Chevrolet dealership is ready and willing to provide you with. When it comes time to finally purchase your vehicle, our team of financial experts will be ready to help you secure the financing you need – no matter what type of credit you may have. Need a lease or loan, or have a vehicle to trade-in? No problem! The finance team at DePaula Chevrolet is here to help. The DePaula Chevrolet dealership is committed to helping all of their customers find the vehicle that is right for them, and it just might be the case that the 2018 Chevrolet Impala is the right car for you. Interested in checking out other vehicles? The sales staff at DePaula Chevrolet will be happy to show you around our extensive inventory of new, used, and certified pre-owned vehicles. So, come visit DePaula Chevrolet today and find the perfect vehicle for you, today!